And what a way to start the year. I’m really setting the bar high for myself! You may remember that for my birthday last year Ma treated me to a Northern Quilting workshop at The Patchwork Chicks in Barrowford. I’ve finally finished the quilt. I call it the château quilt because it reminds me of the carved stonework in the châteaux of the Loire valley. 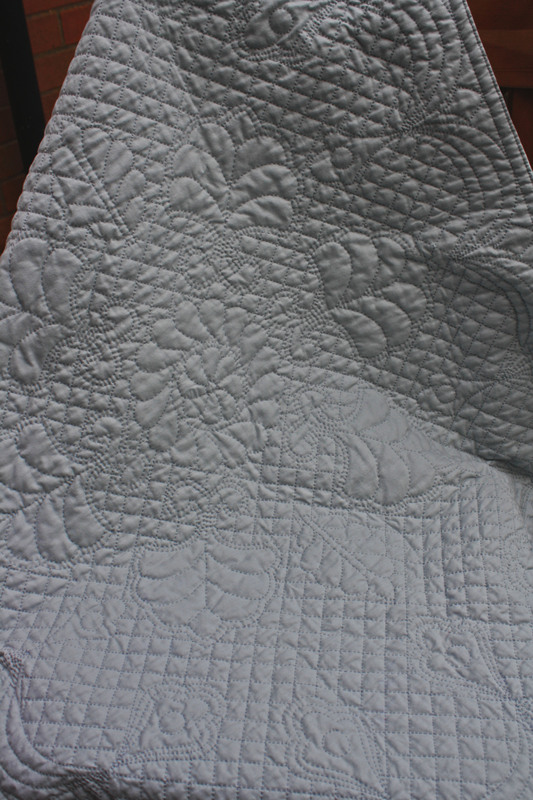 I know that pride is a particularly unattractive trait…but I’m awfully proud of this quilt. 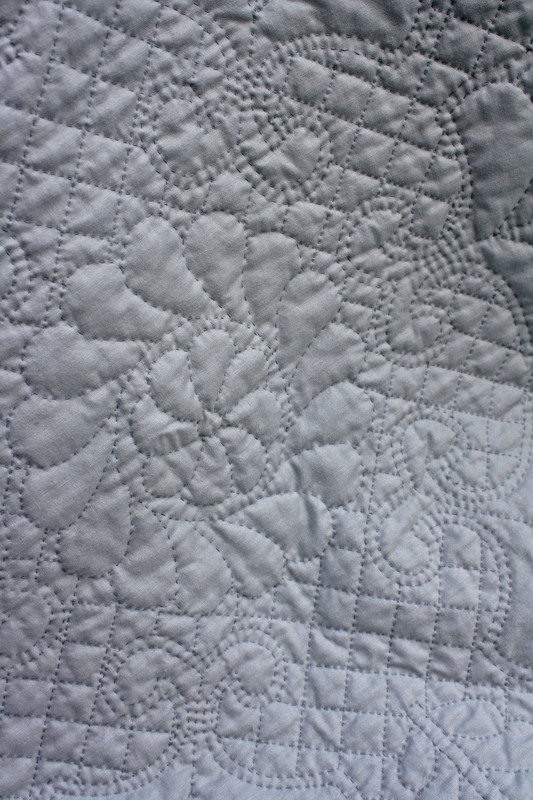 The design is entirely mine utilising traditional quilting patterns. Every stitch is made by hand. Even the edges are turned and hand finished rather than a machine sewn binding. I love this quilt and I’ve enjoyed every single stitch. I love the feeling of continuity with women across centuries who have stitched quilts in exactly the same way as I stitched this one. I really want to make another one…this time double or king sized. But I’m working with Ma on another quilting project at the moment, I have the Gardener’s Journal to finish, and I have another secret quilt project to follow those. So I’m not adding another quilt project to the list for this year. what a fabulous quilt. I would feel proud if I had made it! Did manage a quilted cushion cover once and I remember how relaxing and satisfying it is to see the 3D effect taking shape. Definitely a family heirloom! Looks good. I’d better get stitching! That is so incredible – you should be proud and no apologies! Would love to learn how to do this, these workshops you mention sound such fun. Can´t wait to see what you come up with next. Clever, clever thing you! My goodness, that is wonderful. You should rightly be proud of that. I think it’s beautiful and you have every right to be proud! The stitches are so even. Are you sure this is the first one you’ve done? I am in awe ,all those stitches I would not have the patience required !! You should be proud it’s stunning. Thank you all for the lovely comments. It’s not as tricky as it looks as it’s basically just a running stitch and you follow the design which has been pencilled directly onto the fabric. It’s amazing just how relaxing it is doing this. The quilt has been sewn entirely whilst watching the tv or films! My mum was the tutor on that class at patchwork chicks – she will be thrilled to see this finished. Looks beautiful. Please show her. I had taken her card and lost it. I was going to contact PC to get her email so I could send her a photo. She’s an amazing teacher and really inspired me to complete this quilt. And I can’t stop thinking about the next one I’m going to make. I already know it will be cream and probably a double size. Letting ideas for the design percolate whilst I finish other projects. Thank you. And thank you for your patience and inspiration during our class. I’ve enjoyed making this even more than I’d hoped to…and this has been a long held ambition of mine. I was terrified when I started this and by the end of it was absolutely entranced. 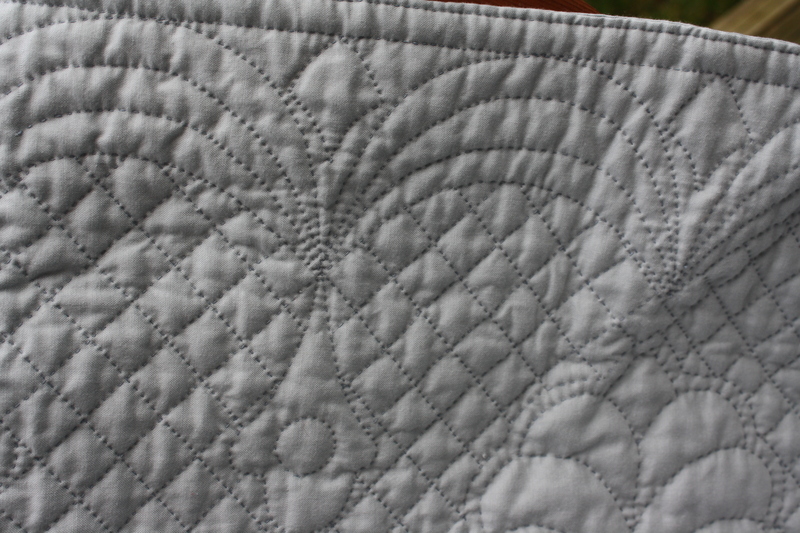 I LOVE quilting by hand. I used a circular hoop, like an embroidery hoop but bigger, which keeps the fabric taut and makes it easier to handle. You’ll have such fun with it.